Please do not make requests for copies of radio programming software which is sold (or was sold) by the manufacturer for any monetary value. All requests will be deleted and a forum infraction issued. Making a request such as this is attempting to engage in software piracy and this forum cannot be involved or associated with this activity. The same goes for any private transaction via Private Message. Even if you attempt to engage in this activity in PM's we will still enforce the forum rules. Your PM's are not private and the administration has the right to read them if there's a hint to criminal activity. If you are having trouble legally obtaining software please state so. We do not want any hurt feelings when your vague post is mistaken for a free request. It is YOUR responsibility to properly word your request. To obtain Motorola software see the Sticky in the Motorola forum. The various other vendors often permit their dealers to sell the software online (i.e., Kenwood). Please use Google or some other search engine to find a dealer that sells the software. Typically each series or individual radio requires its own software package. Often the Kenwood software is less than $100 so don't be a cheapskate; just purchase it. For M/A Com/Harris/GE, etc: there are two software packages that program all current and past radios. One package is for conventional programming and the other for trunked programming. The trunked package is in upwards of $2,500. The conventional package is more reasonable though is still several hundred dollars. The benefit is you do not need multiple versions for each radio (unlike Motorola). This is a large and very visible forum. We cannot jeopardize the ability to provide the RadioReference services by allowing this activity to occur. Please respect this. Has anyone mounted a radio in a Subaru Forrester? We're leasing one and I'd like to mount a TM-D700 radio in there. And, it's my wife's car, so it needs to be as unobtrusive as possible. Here's what the interior looks like. I don't see how you can mount any radio without drilling some holes somewhere. By "no holes" I mean no huge brackets screwed into the dash or NMO antenna holes drilled in the roof. That's my point. If the radio is heavier than one of these handheld scanners, there's basically not a good way to mount the radio without drilling holes for a bracket of some sort. You will either have problems with the radio moving around too much, with it being too easy to steal, or some other issue. I tried attaching a CB to the lower part of the dashboard of a Chevy Celebrity, using velcro. It worked until I hit a bump and the radio crashed to the floor. After a couple of times of that nonsense happening, I undid my bright idea. LOL! I am not familiar with your radio, but if it is one of those with a detachable face, then you will have some options, like brackets that clip on to the vents. "Has anyone mounted a radio in a Subaru Forrester? We're leasing one and I'd like to mount a TM-D700 radio in there." I'm looking to hear from people who HAVE mounted a radio in a Subaru. And the D-700 does have a removable face. I have mounted radios in several Subarus over the years including several municipal leased vehicles for public works people. The last one I did is the Yaesu 7800 ham radio in my granddaughter's 2008 Outback. As far as mounting a radio goes, Subarus are only different in the details from every other vehicle out there. If you can figure out how to do it properly safetywise and without putting a hole in anything, go for it. 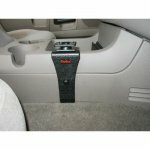 You can try sticking the rough side of adhesive backed Velcro to the radio for mounting on a flat carpeted surface under the seat or such and putting a sufficiently sized tether to the seat frame or whatever other substantial anchor as a back up in times of the dreaded accident and flying objects. The carpet acts as the Velcro fuzzy side for the rough side stuck to the radio, and the anchor assures it'll stay where you put it. I used a piece of 1/8 x 3/4 strap bolted across the top of the radio mounting bracket and drilled a 1/4 inch hole in the seat bracket. Then I bent the other end of the strap to match the surface of the seat frame and bolted that through the 1/4 inch hole. Just make sure none of this interferes with the movement of the seat and that none of the wires get into the seal slide rails or latch/release mechanisms. If you're going to mount the radio on a vertical surface with tape/Velcro/Twin Lock, try to keep it in a low, cool, well ventilated area and on a hard smooth plastic or metal surface so that the adhesive won't be so likely to give up in the heat and the radio can cool, but don't put it where it's in the way of your feet or loading just because the surface is right. You may also find existing bolts under the dash areas that will allow you to drill the mounting bracket to accommodate the bolt spacing, or you could use a combo of a bolt and Velcro. If the bolt is too short, hit a fastener store for the right lengths. For the control head and mic, there are "vent mounts" and dash mounts that use either existing dash fasteners or adhesive mounts and may come with swivels, depending on how elaborate you want to get. Just remember that these vent mounts can make great collision targets for your face and other body parts if not located in a safe place, and some brands and varieties are worth far less that what you'll pay for them. Choose carefully. You can mount any of the radio components with things like double sided tape or 3M "Twin Lock" or other types of adhesive mounting creations, but the combo of summer heat and the volatile oils in the vinyl dash surfaces will usually cause the adhesive type mounts to fail at an inconvenient moment if the entire weight is supported by the adhesive on a vertical surface. Ask me how I know. Down in the console area, adhesive foam tape works well if the head fits into a space where the back surface is tilted back a bit or is flat so that the weight isn't all on a vertical surface. A heads up: most amateur radio lcd displays aren't visible from any angle that is much "below" the middle of the display angle, so if the head is flat on the console surface and is located so that the view is from what would normally be the bottom of the control head, the display may not be visible. I don't know if the 700 has a contrast adjustment to correct for this or not. Antennas are another game. I have no use for a mag mount due to the fact that the cable is going to be compromised by a window or a door closing on it and magnets don't work at interstate highway speeds when combined with really gusty winds. Ask me how I know that. You could preferably use a dual band no-ground plane unit (Comet or Diamond would be a good place to start) on a bracket mounted at the hatch, but you're still dealing with passing the cable through the hatch opening. Luggage rack mounting may not provide sufficient ground or ground plane for the antenna to work properly, but at least with a no-ground plane type you have more options to work with in finding a sweet spot. A lip mount on the hood could work with the antenna cable passed through the firewall at a grommet like the power wires, but keep in mind that the cable will have to be routed to protect it from underhood heat or the feedline will quickly become something other than 50 ohm cable. Ask me how I know that one, too. One thing you won't be able to get around is the proper attaching of power wires to the battery. They've still got to go to the battery, and they've still got to pass through the firewall to get to the battery. Don't even think about skirting the manufacturer's instructions and using the half-assed cobbled-up method of trying to tie to the fuse panel or use a power port. Neither is designed to accommodate a transceiver's power requirements. I used an existing grommet by checking clearances first, then pushing a small Phillips screw driver through the flexy part of the grommet next to the harness to make a small hole for the power wires. The wires are run under the edge of the console and down to the radio through the seat frame in the space next to the seat belt anchors. The Forester may have those seat belt anchors located differently, but you get the picture. Sorry to be so verbose and long in the post. Hope some of this helps. PS: Forget the built-in speaker and get yourself an external speaker and find a place to mount it. You'll thank yourself for that. Those are some great ideas. Thanks. I'm thinking a proclip (as seen above) to mount the head, RF deck under the seat, lip mount NMO on the hood. Again, thanks for the constructive help. Thanks for the pic. I did some checking around and found this vent mount. The site says it's designed to work with Kenwood radios, so this may be just what you need. The radio itself can be mounted under the seat, either by using Velcro (as has already been suggested), or you could make a custom bracket that utilizes the bolts used to fasten the seat frame to the floor. Also, I don't have to be an expert in mounting a radio to be able to point you in the right direction. As I said in one of my posts, I am not familiar with your radio. I didn't know it was one of those with a detachable face. You can go to Eham.net to check out the reviews on this LM-100. Check out QST article on using the glove box by mounting the radio to a piece of metal that hangs on the lip of the glove box. I used this for the courage clasic bike tour in rented vans and it works great highly movable but very stable in vechicle. I also use d700. Attached felt from walmart to the metal to prevent damage to plastic and secured radio mounting bracket with hex bolts from ace hardware. Rob, I live south of you, maybe we can compare notes. elbow bracket antenna mounts. With a sunroof, a roof mount is nearly impossible except at the very back of the roof line. I wouldn't be able to mount a radio that way in my Neon. It would get in the way. I guess that's the price I have to pay for being a good looking fat guy. I hate it that the bench seat has been replaced in so many automobiles. It makes it tough to mount a radio, unless it has a detachable face. I'm not a big fan of center consoles. I should of bought a Impala or a Crown Vic, but it does drive good in the snow and the mpg is better. I mounted a Yaesu FT-8100R in my 2001 Forester in a "no holes" fashion, using many of the techniques wx4cbh mentioned in his reply. The face of the radio is mounted in the center dash pocket/storage tray that I see you still have in a newer model Forester - that place where the optional gauge package goes on top of the dash. Radio Shack used to sell a car radio installation kit that came with lots of great brackets you could adapt for most installs. I used a couple of them to mount the radio face bracket with automotive double stick tape and then Velcroed again to the car surface, this time the interior of the dash pocket. The control cable was routed from the radio body up to the radio face along the center hump and then up the dash. The cable runs along the face of the dash neatly in a crease between panels for about 10 or 12 inches - looks like the design has changed for your Forester so that crease is no longer there. I ran a mic extension cable from the radio face under the dash and over to near the hood release. There I connect in the stock mic and hang it on the drivers door - again with the automotive double stick tape. I have a Diamond NR-770HB antenna mounted on a Diamond K9000LM motorized antenna mount (to fit in the garage) which is mounted to my luggage rack. The coax set I used has about 15 inches of RG-174 small diameter coax on the antenna end that allowed me to bring it in on top of the rear hatch weather stripping and then under an interior panel to be routed all the way up to the passengers seat. All of this has been in operation for eight years without any problems, except for forgetting to lower the antenna a few times (clang!). No holes in any part of the car except the firewall grommet. As a side note, I'm now planning a new install that will replace some of my gear and add some new stuff. I'm going to pull out the factory double-DIN stereo and put in a single-DIN HD radio and also a PRO 197 scanner. I'm going to change out the FT-8100R for a FT-7800R, and in the process clean up the radio face mounting. I have on order the housing for the optional gauge package (minus the gauges), to which I will fashion a mount for the FT-7800R (or the scanner, I haven't decided which will be up top yet). That housing is probably available for your model year as well if you want to go for a more integrated look. As it is now I can actually pull up the radio face from the pocket and push it back in the pocket and then close the pocket cover for security. Let me know if you want to see some pictures of the install or if you have any questions. Dont forget to look up!!! What about an overhead console? ANyplace to mount a radio head there?